fundamental value. As the market sounds bullish many of them might be in longs or more possibly willing to take a fresh long. Many of us might have a trouble with fixing the Stop Loss. a support/resistance point . And Support/Resistance line decreases/increases with respect to time..From the above picture Chart 1 shows that GANN Fan lines are applied to Nifty 2 year chart from the chart we had earlier concluded that 4980-4990 could act as resistance zone But the resistance zone was broken on 18th Sep 2009. Chart 2 shows the zoomed part of the recent scenario. From the chart 2 we could observed that Since 18th Sep 2008 the GANN Support lines hold without any small glitch for the past 6 days followed by a clear trend reversal yesterday(30th SEP 2009). From the Zoomed GANN Chart we could easily identify that 4940-4960 will act as the Base Support in Coming sessions which could be the stop loss and exit point for your long. Below 4940-4960 levels hungry bears are waiting!!! 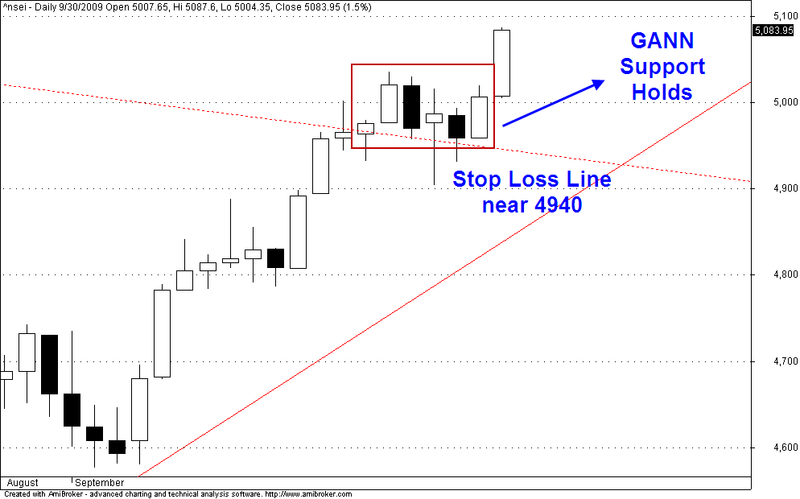 where is the resistance.. the chart seem to suggest above 6000? 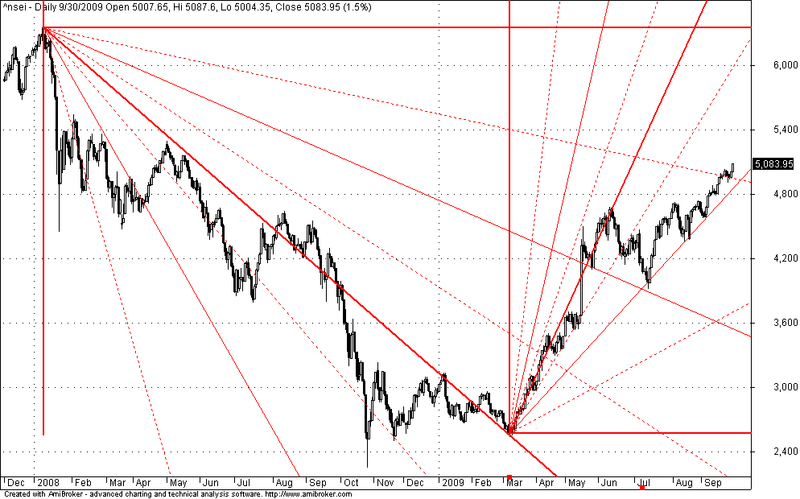 nifty has takens support exactly at the gann support. kudos to you.